Hundreds of Detroit fast food workers plan to walk off the job beginning at 6 am today, making the motor city the fourth in five weeks to see such strikes. Organizers expect participants from at least sixty stores, including McDonald’s, Wendy’s, Subway, Little Caesar’s, and Popeye’s locations. Like this week’s strike in St. Louis, and last month’s in New York and Chicago, today’s work stoppage is backed by a local coalition including the Service Employees International Union, and the participants are demanding a raise to $15 an hour and the chance to form a union without intimidation. A spokesperson for Jimmy John’s declined to comment on Thursday’s strike. McDonald’s did not respond to a Tuesday inquiry about the fast food campaign; Wendy’s did not respond to an inquiry last night. As I’ve written elsewhere, the fate of the fast food strike wave carries far-reaching implications: Fast food jobs are a growing portion of our economy, and fast food–like conditions are proliferating in other sectors as well. Organizers say the fast food industry now employs twice as many Detroit-area workers as the city’s iconic auto industry. These strikes also come at a moment of existential crisis for the labor movement, a sobering reality that was brought into sharp relief in December when Michigan, arguably the birthplace of modern US private sector unionism, became the country’s latest “right to work” state. Along with a shared significant supporter—SEIU—the campaigns in New York, Chicago, St. Louis and Detroit have apparent strategies in common. Rather than waiting until they’ve built support from a majority of a store’s or company’s workers, they stage actions by a minority of the workforce designed to inspire their co-workers. Rather than publicly identifying the campaign and its organizers with a single international union, these union-funded efforts turn to allied community groups to spearhead organizing. Rather than training all their resources on a single company, they organize against all of the industry’s players at once. And—faced with legal and economic assaults that have weakened the strike weapon—these campaigns mount one-day work stoppages that are carefully tailored to maximize attention and minimize, but not eliminate, the risk that workers will lose their jobs. Whether these strategies can ever compel a fast food giant to negotiate with its employees remains to be seen. Update (9:15 am Friday): According to the campaign, a walkout by twenty workers at Detroit’s 10400 Gratiot Avenue McDonald’s prevented the store from operating. Some workers brought in as strikebreakers to replace those striking workers chose to join the strike instead. Organizers say that by day’s end, today’s strike could be the largest fast food work stoppage yet, topping last month’s 400-strong strike in New York. Update (11:50 am): Along with the Gratiot Avenue McDonald’s, organizers say that strikes shut down at least three others stores: a McDonald’s on Van Dyke; a Long John Silver’s on 8 Mile; and a Popeye’s on Grand River, where strikers were joined by US Congressman John Conyers. Strikers plan to converge for rallies at 1 and 4 this afternoon. McDonald’s, Wendy’s, Chipotle, and Long John Silver’s did not immediately respond to requests for comment this morning. 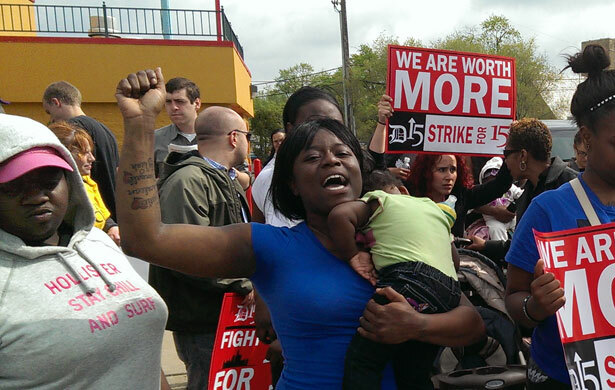 Update (2:05 pm Friday): The campaign now says there are over 400 workers on strike in Detroit, making today’s action the largest fast food strike in US history. That figure includes workers who woke up today planning to work and then changed their mind; at one McDonald’s store, the campaign says eight workers decided at the last minute to join the strike after watching four of their co-workers walk off the job.